At a time when few Speyside distilleries were using peat in production, The Balvenie decided to distill a batch of heavily peated malt, which was laid down to mature at the distillery in Dufftown, Scotland. Ever since, they’ve dedicated one week each year, named Peat Week, to using 100 percent Highland peat to dry its barley. Instead of coastal elements of iodine, salt and medicinal characteristics associated with Islay peat, Highland peat imparts an earthy, woody smoke note. This means the peat has an unexpected sweetness rooted in the Speyside regional character. The Balvenie distillery is located in the town of Dufftown in the Speyside region of Scotland. It was founded in 1892 by William Grant and was built next to its sister distillery of Glenfiddich. Balvenie is still owned by the Grant family and has had an annual production capacity of 1.48 million gallons. It’s still one of the most traditional distilleries in Scotland as all stages of the whiskey making process happen on site – growing the barley, malting, mashing, fermentation, distillation, coopering and maturation. Balvenie is one of the best-selling single malts in the world and sits comfortably in the Top 10 for sales volume. The color is a golden yellow and the nose is vibrant, fresh, and sweet. There are plenty of peat smoke aromas up front and these create an instant soft earthiness. Combating this are distinct aromas of honeycomb and vanilla, plus a whiff of dried apple and candied lemon. The palate has its sweeter elements from the nose that hit first. They whiskey feels viscous and full, almost syrupy. There are plenty of honeycomb, vanilla notes, and hints of brown sugar. Underneath the initial taste is subtle hints of green apple, pear and a hint of apricot jam. Warm wood-like spices are everywhere as well. All of this is underpinned by a decent level of soft peat smoke that is never too far away. The finish is long, and the smoke really hits at the end. The sweet notes fade into a drier mouthfeel. The smokiness turns ashier and the warming wood spices grip your tongue and take hold of your throat. It was difficult to know what to expect but it does not disappoint. The whiskey is tasty, balanced and easy drinking, even at the slightly high strength. It would be a good introduction to the world of peated whiskeys for someone too. Although the peat PPM level is around 30. The smoke seems quite punchy, but it still has some way to go to go fighting with the big heavy Islay malts. 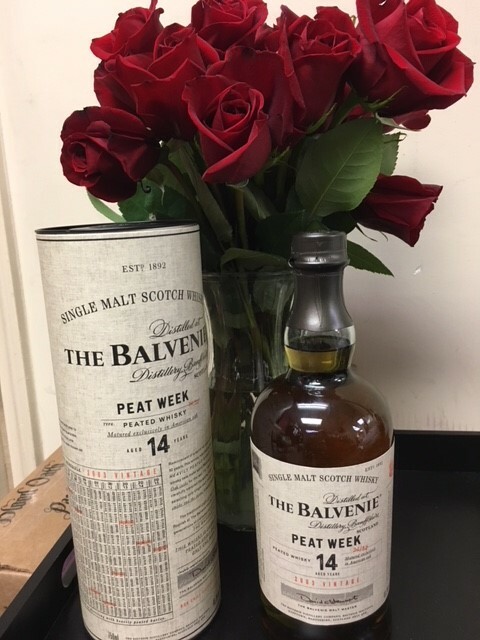 Does Balvenie’s Peat Week sound like something you would like to add to your collection? Contact us to reserve this bottle and get a taste of one of Scotland’s most traditional distilleries.